It’s time once again for all of the internet to share the things that made our week just a little bit better. And to do a little victory dance. And to get the song “My Favorite Things” stuck in our heads. (Sorry.) So here are a few things I am loving lately, as I wrap up a pretty lovely week with my fantastic family of four. It feels like we’re coming out of hibernation around here. I really didn’t realize how much we missed FRESH AIR until the kids and I started running around and shouting gleefully in our backyard. Ironic, because getting outside was part of my advice that I just wrote about in How to Love Life with Little Ones. yay for taking my own advice! I’m a fully fledged chai addict, but it took me awhile to be able to make a good cup at home. Enter the chai tea mix. I have a few favorites, but Big Train chai mix makes me melt into a puddle of cozy deliciousness. 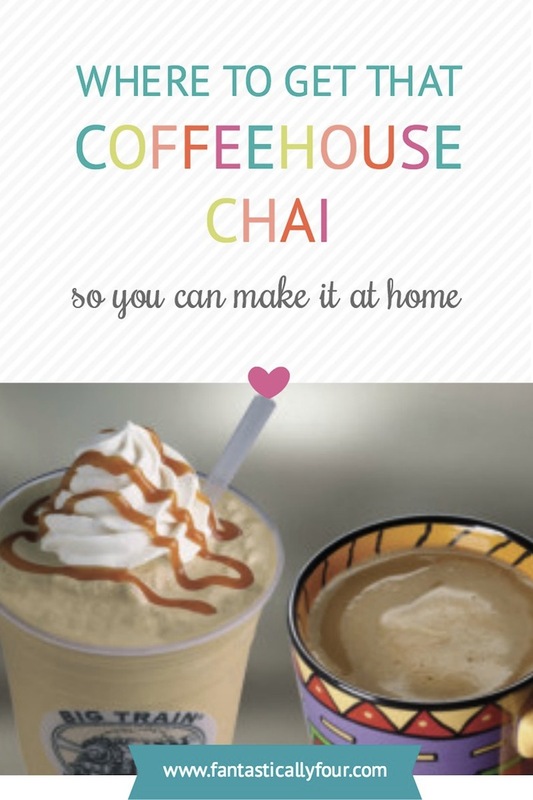 This is the chai that’s sold at our local coffeehouse, and for some reason, they go ahead and sell the mix in the store for us to make at home. It truly tastes just like it does at the coffeehouse! I used to drink it every weekday in the fall and winter as my special treat for the day, but then things changed a bit and for a couple of years I tried other things. Now I’m back and I’m really, really, glad I am. I’ve tried the Spiced flavor as well as the Vanilla, and they are both great–just be sure you make it with milk, not water. Oh, and you can easily make it over ice in the warmer seasons. Last week I finished the book Kristin Lavransdatter and posted a little review. If you have ever read this book, or just know about it, you are probably cheering me on right now. *Thanks! * And wow, it feels all sorts of good. Speaking of goals, I’d also love it if you would follow Fantastically Four on Bloglovin’ so I can meet another lofty aspiration to double my followers (from one to TWO)! Bloglovin’ is a fantastic way to stay up to date with your favorite blogs. 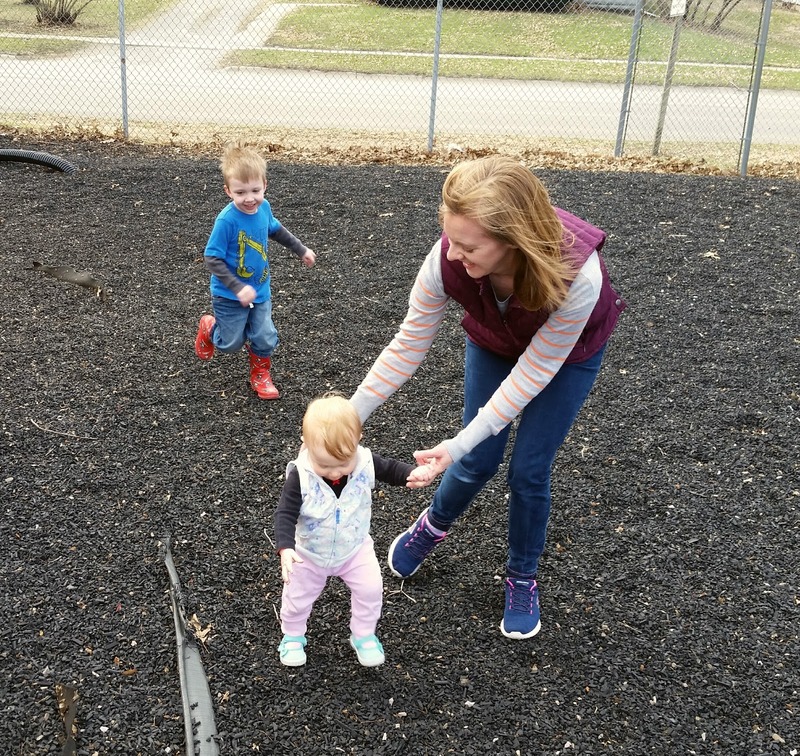 I think you’ll like the post I have scheduled to go on Monday…it’s all about tips on helping toddlers transition between activities. I had the perfect opportunity to write about St. Patrick’s Day last Friday along with everyone else, but I was taking a break to revel in my Kristin Lavransdatter accomplishments. I put zero pressure on myself to make it a pinterest-perfect kind of day, so at first I didn’t think I’d even mention it here…but then I realized we ended up doing a lot for it (despite a lack of green-colored toilet water). 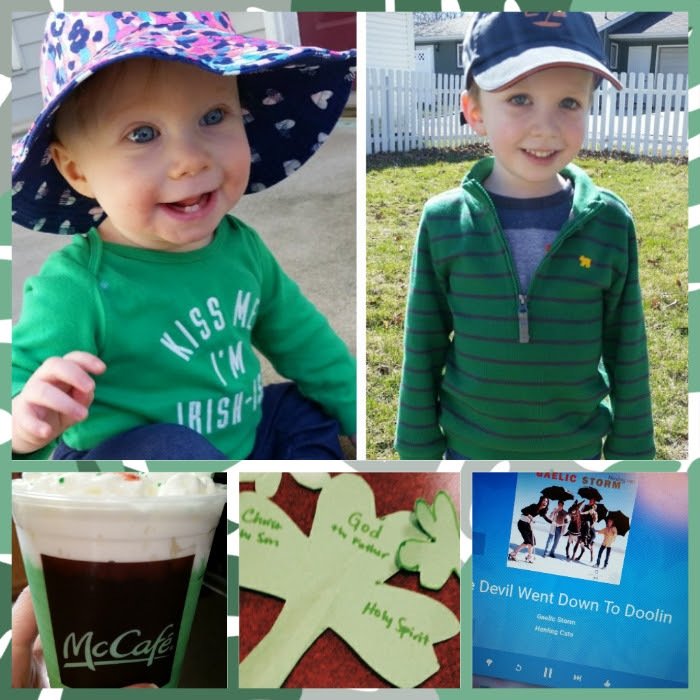 For the holiday, we listened to Pandora’s St. Patrick’s Day radio station all day, wore green, colored drawings of St. Patrick and talked a bit about who he was, used the clover illustration to learn about the trinity and sang the accompanying song, and…I admit it…then we drank shamrock shakes from McDonalds. 🙂 The weather was beautiful and it turned out to be a fantastic day. I started dry brushing a couple of months ago, and I feel like I’m ready to give my report: I’m in favor of it. It’s made my skin so soft and silky (because exfoliating means the skin can absorb lotion/moisture better), and I think the increase in circulation has actually helped cut down cellulite for me. Just a little. Seriously. Here’s a video about what it is and how to do it. It’s so quick, easy, and affordable…just buy a brush once and you’re in business! Tell me what you’re loving this week. Thanks for linking to my Teaching the Trinity post! It was so nice. We're in for a rainy week now, but my daughter keeps pointing out the window to our backyard and shouting. Poor girl! I know, it's amazing what a difference the weather makes! What a wonderful week! I am SO glad the weather is warming it up. Getting out with the little ones is so wonderful! Yay for Friday! It's so great when the weather is nice enough to go outside. 🙂 I'm glad you were able to do some fun things for St. Patrick's Day!